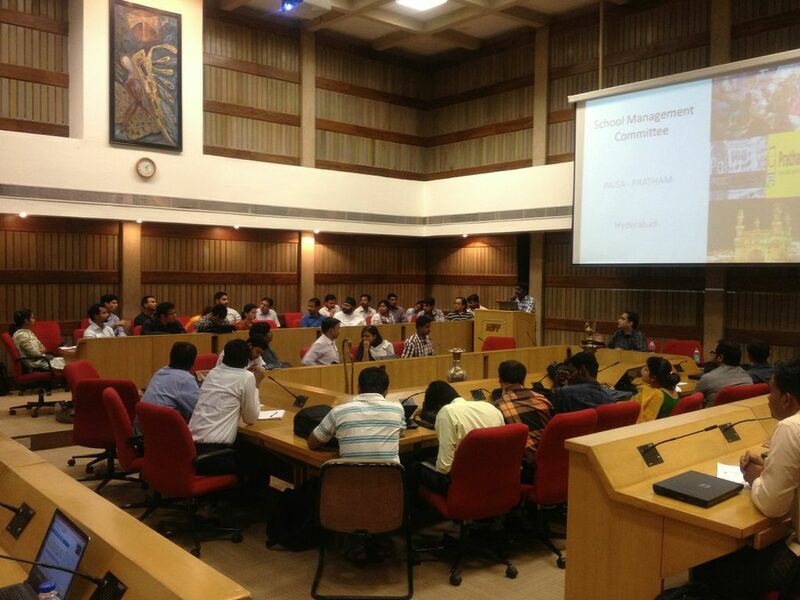 Participants attending a session on Community Engagement in New Delhi on May 16, 2013. Overview: A course workshop was organised by ASER Centre, Delhi from 12th to 17thMay 2013. It was attended by ASER Regional Team members (ARTs), ASER Associates (AAs) working for ASER and PAISA project. These workshops are planned keeping in view the vision for Capacity Building of the team across India and are held at regular intervals throughout the year.The workshop schedule was broadly divided into two sections – Course and Workshop. From 12th May to 15thMay, three batches namely, Batch 1, Batch 2 and Advanced, comprising participants from different states attended course work sessions on subjects such as Descriptive statistics, Communication, Research Methods and Computer Applications. From 16th May to 17th May, all participants attended sessions conducted by the Social Sector Unit, Assessment Unit, BEP Overview and Community Engagement. The last two days of the workshop were attended by all the participants, Research Associates and representatives from the Central Square Foundation, Saajha, and Accountability Initiative. Course Work: All the three batches attended Statistics classes. The classroom sessions began with a revision of all the concepts covered earlier in the month of March, followed by the introduction of new concepts as per the curriculum. Participants were divided into groups and a lot of practice in solving problems was taken up during these sessions. Class Tests were held for Batch 1 and Batch 2 participants, after which the question paper was discussed and solved in the class. An extra class for Batch 1 was organised on 17th May to clarify doubts in Statistics. Batch 2 was given an assignment which they will be submitting later, requiring them to use concepts of Statistics and their knowledge of STATA to generate and analyze simple descriptive Statistics using the Master Trainer data for 2012. In Communication and Research sessions for Batch 1, the assignments that were given in the previous course workshop were discussed in detail. New assignments were given to the participants. In addition to this, Batch 1 and the Advanced batch participants learnt about training, role of a trainer, types of learners, training methods through case studies, activities, etc. The STATA sessions for Batch 1 and Batch 2 had participants revising their course. Extra classes were held for those who required more attention. Workshop: From 16thto 17th May, all participants attended sessions conducted by different units of ASER Centre, and to discuss the Community Engagement project. Social Sector Unit (SSU): ASER Centre is beginning to work in the ECD domain with a focus on the less than 3year age group. The SSU is attempting to formulate a basic course on food and feeding that builds the capacities of the participants to understand basic concepts in nutrition and their application. During this first session, participants were allocated a field task for which formats were provided during the session. In the next workshop, the teams will be expected to have completed the field task and their findings will be discussed. BEP Overview: A state-wise overview of the Block Excellence Programme and its results were presented to all the participants. Issues and experiences were discussed at the forum. Assessment Unit: The Assessment Unit presented the participants with information on ASER and the National Assessment Survey (NAS) conducted by NCERT, the only two nation-wide assessments measuring the learning outcomes of children at the primary level. Lately, there have been comparisons made between the two in the Parliament. However, the Assessment Unit pointed out that these two assessments are very different from each other in a number of ways such as, test content, methodology, sample (only rural vs. rural and urban), purpose, and years for which the results are being reported. More importantly, the results are also computed very differently. Hence, the results of NAS and ASER give a different picture of learning in India and can’t be compared. Tools used by NAS were shared and explained to the participants. The aim of the Textbook Analysis is to gain greater insight into various aspects of a child’s learning such as, language comprehension, reading ability, articulation, skills of observation, classification, drawing, and the other skills which constitute learning at this stage. The above themes were chosen because they are taught in a progressive manner through classes 1st to 8th. The rationale behind listing of vocabulary is to encourage learning through local language or the mother tongue; but to avoid a ‘purist’ approach, and to not load the child with terms and words that don’t hold much meaning to the child. Survey Formats: A session on new survey formats for the states of Chhattisgarh, Rajasthan, Himachal Pradesh and Uttarakhand was conducted on 13th May. On 16th May and 17thMay, the participants were introduced to a new concept of engaging communities to improve the learning outcomes amongst children. While initiatives have been taken by Pratham and ASER Centre to engage the community in promoting education, the aim now is to establish a deeper and meaningful relationship with the community that yields an improvement in children’s learning. Prior to the beginning of this session, the state teams were asked to present their ideas and action plans to implement Community Engagement in villages. The presentations made by the state teams were observed and discussed by the Capacity Building Unit and participants.